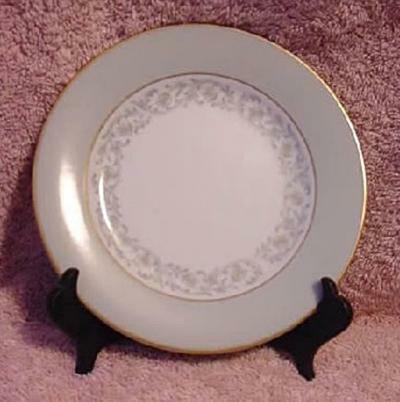 What Antique Noritake China Patterns Have Gold Edging? 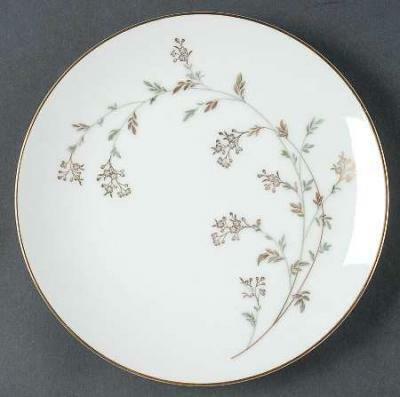 Noritake china is famous for its delicate designs, some of which feature beautiful gold trim. These patterns hold a special place in the hearts of collectors and enthusiasts, so it's helpful to know a bit about the many gold-edged patterns of antique Noritake china. 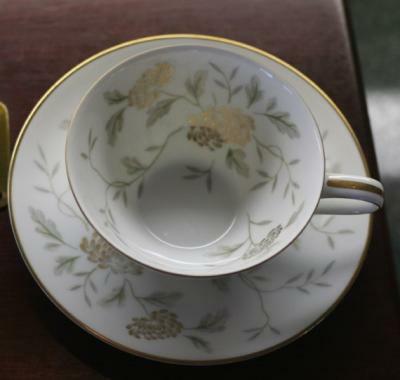 Noritake has a long history of making gold-edged china, and there are many Noritake patterns that feature gold edging or trim that are more than 50 years old. If you're wondering about the name of yours or the identity of one you found in an antique shop, turn the piece over. 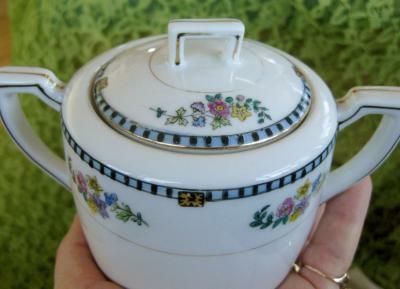 It should always be marked with the Noritake name, as well as the name or number of the specific pattern. If the piece only has a number, you can look it up on a site like Robbins Nest, which has a complete listing of all known patterns. This pretty floral pattern features a cream rim, delicate green and pink flowers, and lots of lacy gold trim. It was discontinued in 1933, but it's still possible to find pieces at antique shops and online. Expect to pay about five dollars to $25 per piece. Also discontinued in 1933, Adelphia features a beautiful neutral pattern of brown, cream, and gold. A spray of brown flowers graces the center of each piece. These are a bit harder to find, and they retail for about $25 to $50 per piece. Made between 1954 and 1962, Andrea was a more modern design with a simple curving spray of flowers on gray stems. It featured gold edging, as well as gold accents on the flower. This pattern is easy to find, and pieces retail for between $15 and $50. A spectacular and elaborate floral pattern in blue, cream, and pink, Alexis also features gold trim. Dinner plates have a scalloped edge. This pattern was discontinued in 1933, and it isn't easy to find. Expect to spend between $30 and $80 per piece. This beautiful yellow, pink, green, and ivory floral pattern has Art Deco touches in the shape of the handles. It features gold trim on the edges and was discontinued in 1933. This pattern isn't easy to locate, so expect to spend between $30 and $90 per piece. Discontinued in 1918, Azalea features a bold, hand-painted pink and sage floral pattern and gold edging. There are many pieces in this pattern, ranging from simple teacups to relish dishes and other rare serving pieces. Depending on the rarity of the specific piece, you could spend as much as $200 per item. This Oriental pattern, which was discontinued in 1962, features a simple design of bamboo shoots and leaves. A gold rim outlines each piece. Since it's relatively easy to find, this pattern retails for between five dollars and $25 per piece. This beautiful pattern features scrolls and floral motifs in yellow, pink, and green, as well as gold trim. It was discontinued in 1933 and is very hard to find. It typically retails for between $30 and $80 per piece. This sweet pattern has decoration only along the edges in shades of pink, lavender, green, and gold. It was manufactured between 1921 and 1924, so it is not easy to find. Expect to spend about $30 for a dinner plate in good condition. Made between 1953 and 1960, this yellow and tan floral pattern has a gilt edge. It features yellow roses all around the rim. This pattern is easy to find and retails for about five dollars to $50 per piece. This bamboo-themed pattern features green leaves and stalks and was manufactured between 1950 and 1964. The edge has a narrow band of gold trim. It's fairly easy to find, retailing for between five dollars and $50 per item. 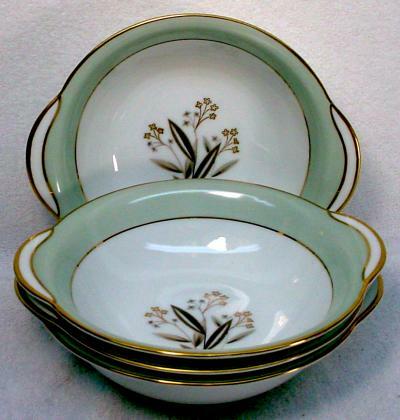 This simple design, made between 1954 and 1959, features a pale green rim, gold flowers, and two gold bands. It's easy to find in resale shops, ranging from about five dollars to $60 per piece. Discontinued in 1953, Carole is a leafy green and gray pattern with a simple gold rim. It's affordable and easy to find, retailing for about five dollars to $25 per piece. Made between 1958 and 1962, Chartres has a gold rim, gray-green edge, and simple decoration of gray scrolls. It is not especially rare and retails for about five dollars to $40 per item. A subtle white-on-white and gray tiny floral pattern with a gold edge, Chelsea was made between 1957 and 1962. It's easy to find and retails for about five dollars to $30 per piece. Made between 1950 and 1952, Cyclamen is a beautiful design with a spray of large pink sweet pea flowers and a simple gold edge. It isn't hard to find in antique stores, retailing for about $10 to $100 per item. Featuring gold trim and a simple gray and pink floral design in the center, Daryl is a lovely pattern that was made between 1954 and 1963. It is easy to find, so expect to pay only five dollars to $60 per piece. This yellow, brown, and gold-trimmed pattern has a floral design in the center of each piece. It was made between 1952 and 1954, and it is not easy to find. Expect to pay about $10 to $100 per piece. The Dover pattern showcases light blue flowers with gray and swirling vinery. It was produced from 1955 until 1961. Pieces may range in price from less than $10 a plate to upwards of $100 or more. Discontinued in 1921, this Deco-style pattern features blue and tan graphic embellishments on a cream background. It also has a gold edge. It's a rare pattern and retails for between $20 and $200 per piece. A very simple white design with a gold edge and gold inner ring, Goldart was made between 1952 and 1962. It's easy to find and retails for between $10 and $100 per piece. Discontinued in 1921, Grasmere is a beautiful Art Deco pattern with small flowers and gold geometric trim. Despite its age, this isn't too hard to find. It retails for between $10 and $90 for most pieces. 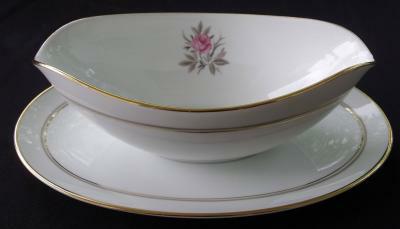 Made between 1950 and 1954, Gwendolyn is a simple white pattern with a wide gold band. It's easy to find and retails for between $15 and $90 per piece. Featuring a wheat design in gold and brown, Harvester was made between 1954 and 1959. It's easy to find and retails for about $20 to $100 per item. Made between 1957 and 1961, Janice is a pretty floral pattern in a muted palate of green, gold, and gray. It has a gold rim. This pattern isn't hard to find and retails for between $15 and $150 per item. Discontinued in 1921, Juanita is a pretty design with delicate pink, blue, and yellow flowers, a cream background, and a gold rim. It's hard to find, but it still only retails for between $10 and $200 per piece. 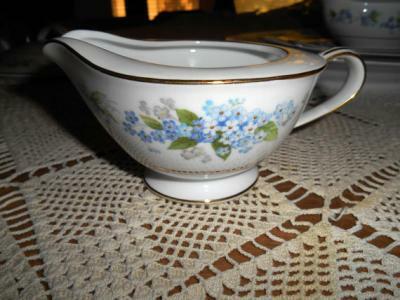 A simple and lovely pattern made between 1954 and 1962, Lily of the Valley has a gold rim and a spray of pink flowers. It's easy to locate in antique stores and retails for about $10 to $100 per item. A rare pattern discontinued in 1933, N19 features a large pink and green orchid in the center with a double gold band around the edge. It retails for between $10 and $200 per item. Another rare and early pattern, N95 was discontinued in 1933 as well. 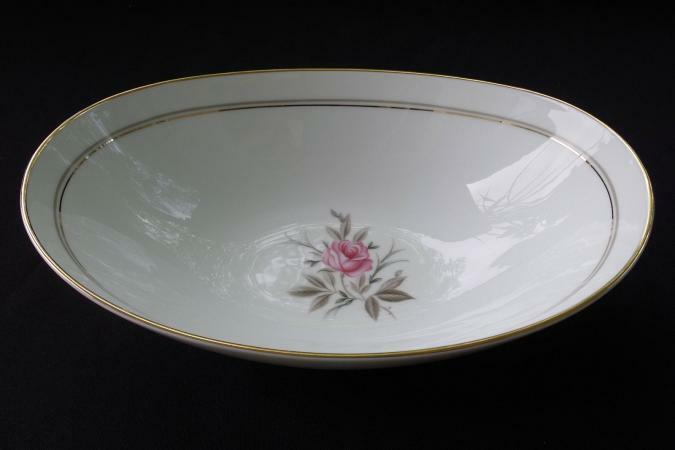 It has a cream edge with a decorative floral motif in gold, yellow, and pink, as well as a gold rim. It retails for about $30 to $250 per piece. 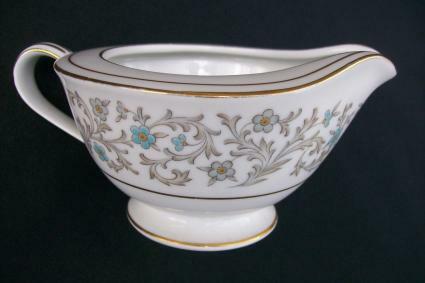 A rare pattern discontinued in the early 1920s, Nippon is a simple cream design with wide gold edge and gold handles. It retails for between $15 and $150 per item. Made between 1952 and 1956, Norma features a bold pink flower in the center and a single gold band around the edge. Most pieces are easy to find and cost between $10 and $70 each. With its wide gold edge and pattern of green, blue, and lavender, Oakwood was a rare pattern made between 1950 and 1951. Since it was only made for a short period, pieces are hard to find and retail for $30 and more. Another bamboo-themed pattern, Orient has green leaves and stalks and a narrow gold edge. It was made between 1950 and 1957 and isn't hard to find. It retails for between five dollars and $50 per piece. An elaborate pattern discontinued in 1921, Paisley features an urn of brightly colored flowers and a graphic border with a gold edge. It's relatively easy to find and retails for between five dollars and $100 per item. Made between 1951 and 1957, Ramona has a beautiful design of tiny green, blue, and white flowers. It features a narrow gold edge as well. It is relatively scarce and retails for between $20 and $200 per piece. Discontinued in 1933, Raphael is an elaborate pattern in tan, teal, and brown with a gold edge. It is somewhat rare and fetches between $10 and $70 per piece. A delicate blue and gold floral pattern with a gold rim, Remembrance was made between 1950 and 1957. It's easy to find and retails for between $10 and $90. 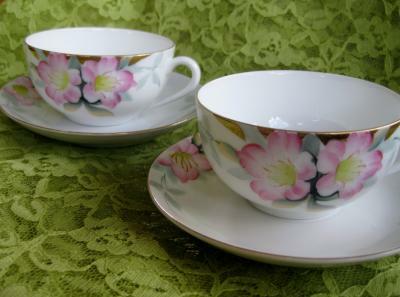 Discontinued in 1921, Romance is a delicate pattern with pink, blue, and yellow flowers and a gold-banded rim. It is hard to find and retails between $50 and $200 per piece. Made between 1950 and 1957, Rosilla has an all-over pattern of pink roses and blue flowers and a narrow gold edge. It is easy to find and retails for between $10 and $80 per item. White with a blue and black rim, small pink flowers, and a gold edge, Sheridan was discontinued in 1921. It's not easy to find, but it isn't especially expensive. A dinner plate retails for about $20. Whether you're looking for a new pattern to collect, are curious about the pattern handed down by your grandmother, or simply want to know more about a piece you found, having a list of all the gold-edged patterns can help. If you can't find your pattern on this list, it may be more recent, or it may be among the few unidentified patterns out there. In that case, it's a good idea to take your piece to an antique specialist to find out more.